My girlfriend sent me a text asking me to make her a red one, then my mom wanted a blue/grey one. Here are the steps so you can make your own instead of paying $50 -$75. 1) (like always) I grabbed a bunch of scraps from my wood pile. 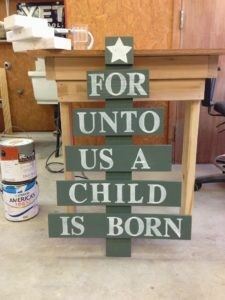 I stuck to 1/2″ plywood and started by cutting 4″ strips.2) Then I brought out my 3″ stencils and played around until I figured out how long I needed each board to not only hold the correct amount of letters, but to also make up the Christmas Tree shape, then I made the cuts needed with my table saw. 3) Now that my boards were cut, I painted the base color. Note: Click on the photo to see the dimensions of each board. 4) Then painted on the letters with the stencils. 5) I didn’t like the breaks in the letters from using the stencils so I went back with a paintbrush and filled them in. Then also went back with the base color and touched up some of the letters that didn’t come out quite so clear (such as that B). 6) The last thing to do is attach the boards to a vertical board. 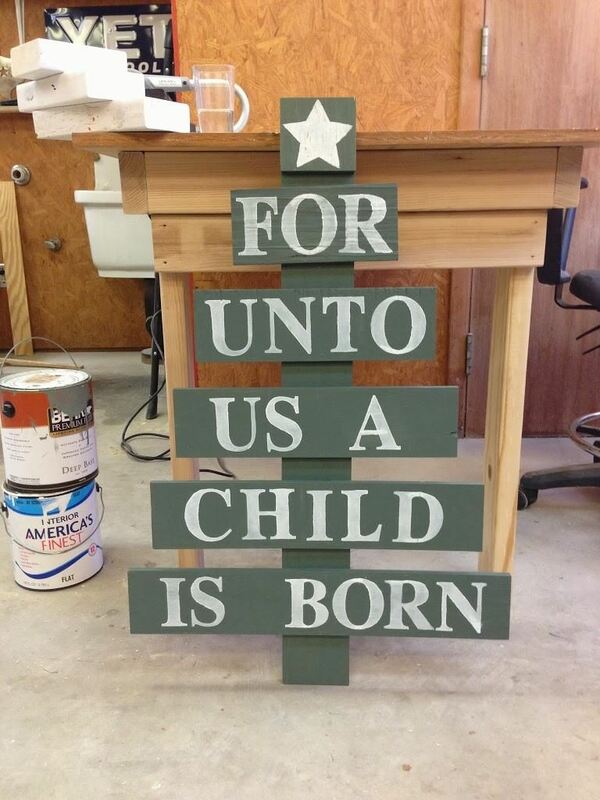 I used a 4″ board and cut it to 32″ then used my nail gun to stick everything in it’s place. If you want to put this in your yard, then just grab another piece of scrap wood and cut it to a point on one end to create your own stake. Then attach it to the backside of the tree’s trunk so that when you put it in the ground, the trunk will look like it’s resting on the ground.Or, if you want to hang it on the wall, just put a picture frame hook on the back and throw it up somewhere! Oh yeah…just in case you like the colors, the blue is Heron and the red is Red Brick. 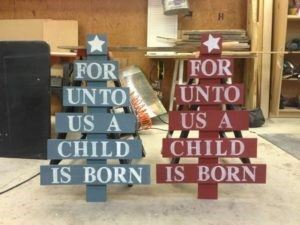 Both are made by Behr. *Update* I had a request for a green one, so I thought I would post a picture just so you could see it in green. This green is Dense Shrub by Behr.